This page provides a guide to Swahili learning materials such as books and tapes, as well as to print dictionaries between Swahili and other languages. Any purchase you make from Amazon by following the links from this page will return a portion of the sale price to the Kamusi Project. If you are able, we also ask that you help us maintain and expand our project resources through your donations. Many books and other resources are available in libraries, or can be purchased on the Web. This page provides links through which you can purchase many of the resources we know of that are currently available. We are particularly fond of the Lonely Planet Swahili Phrasebook (2nd Edition), a small introductory book written by three editors of the Kamusi Project, and the Lonely Planet Swahili Phrasebook (3rd Edition) , which doesn't have as many nice cultural notes as the 2nd Edition but does include phonetic transcriptions of every phrase. And now there is the Lonely Planet Swahili Phrasebook & Dictionary (4th Edition) . Masomo ya Kisasa: Contemporary Readings in Swahili, by Ann Biersteker. This book is designed to enable students at the intermediate and advanced levels to read and understand authentic texts in Swahili. Appropriate for classroom or independent use, this book provides a transition to unassisted reading of journalistic, scholarly, and literary works in Swahili. Swahili Learners' Reference Grammar, by Katrina Daly Thompson. This is a comprehensive and extremely useful text to help students understand the fundamentals of a wide variety of Swahili grammatical structures. The book does not assume any prior knowledge of grammatical terminology. Rosetta Stone: Swahili Explorer instructional software program. Swahili - a foundation for speaking, reading, and writing, by Thomas Hinnebusch and Sarah Mirza, is the most widely used and recommended text for first-year Swahili. Simplified Swahili by Peter Wilson has received many enthusiastic reviews from its users. Swahili Made Easy by J.F. Safari is often used by expatriates in Tanzania. Swahili/English: Level 1: VocabuLearn audio cassette program. Below are bibliographic references for some Swahili dictionary resources. This posting is by no means a complete Swahili bibliography. Rather, this page is intended to help you begin looking in your library or bookstore. When you come across works that you think should be referenced here, please send us the bibliographic information. Compiled by Taasisi Ya Uchunguzi Wa Kiswahili, Chuo Kikuu cha Dar es Salaam, published by Oxford University Press, Dar es Salaam, 1981, 336 pages. 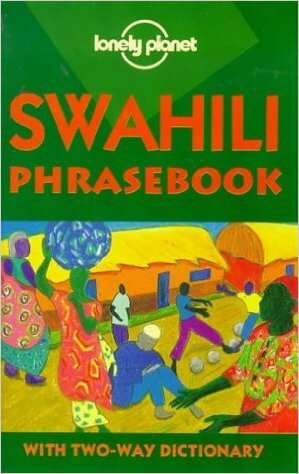 This is a highly respected dictionary of the Swahili language, written entirely in Kiswahili. Kamusi ya Methali za Kiswahili by Ahmed Ndalu, a Swahili dictionary of sayings, published by Heinemann Kenya, 206 pages. Kamusi ya Methali by K. W. Wamitila, a Swahili dictionary of sayings, published by Longhorn, January 2001, 312 pages. Kamusi ya Visawe by Mohamed Abdulla Mohamed, a Swahili thesaurus, published by African Books Collective, 1998, 268 pages. Edited by Charles Rechenbach and printed by The Catholic University of America Press in 1968, ISBN not available. The Catholic University of America Press has granted the Kamusi Project permission to incorporate this work into our database, provided that royalties earned from the sale of the project's works are reinvested in the project itself. We acknowledge and are deeply grateful for this permission. The Friendly Modern Swahili/ Modern English Dictionary, 2nd Edition 1994, revised and enlarged. By Gerald Feeley (Baba Malaika), published by the Danish Training Centre for Development Co-operation, P.O. Box 254, Arusha, Tanzania, ISBN 87-7028-742-2. Printed in Denmark by MS-tryk. This dictionary is intended for practical, 'front lines' use. Many other dictionaries contain a 'classroom' lexicon, whereas this one has current, everyday usage of Swahili words. It includes words that have come to have impolite connotations, and includes slang meanings for certain entries that are often left out of other publications. Kamusi ya Kiswahili - Kiingereza - Swahili - English Dictionary by TUKI - The Institute of Swahili Research at the University of Dar es Salaam (January 2001). Published by TUKI, 372 pages. English Swahili Pocket Dictionary by J.F. Safari, published by Ghana University Press, 1998, 271 pages, and Swahili English Pocket Dictionary by J.F. Safari, published by Mkuki wa Nyota, 2003, 201 pages. Other dictionaries exist in this category, so please send us the full references. Dictionnaire Swahili-Francais, Sacleux's great work, published in Paris by the Institut d'Ethnologie in 1939. Dictionnaire swahili-francais, By Alphonse Lenselaer, partiellement adapte du Standard Swahili-English dictionary de Frederick Johnson, avec l'autorisation d'Oxford University Press. Published in Paris in 1983 by Karthala, ISBN 2865370658. Published in Moscow by "Russkii iazyk", 695 pages. 1987 , compiled by Ekaterina Nikolaevna Miachinoi, Nelli Vladimirovna Gromova, et al..
Suakhili-russkii slovar : okolo 30,000 slov / pod; redaktsiei E.N. Miachinoi ; s prilozheniem, "Kratkogo grammaticheskogo ocherka iazyka suakhili"
Compiled by Tsuneo Morino, published 1990 in Tokyo by Tokyo Gaikokugo Daigaku Ajia Afurika Gengo Bunka Kenkyujo, ISBN not available. Send us references and we'll include them here.